Posted October 2018. This home has been archived on OHD. The sold status is unknown. Savills and James L.Murtagh are delighted to present Forgney Lodge. This is an attractive, well proportioned former gate lodge built in c.1860 to serve the main entrance to Newcastle House. 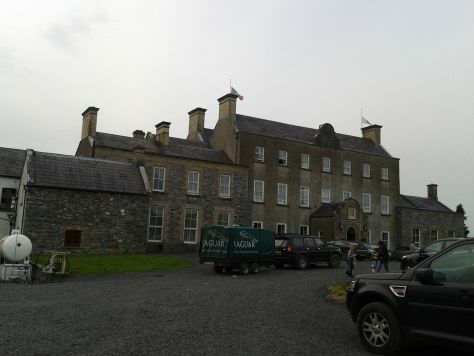 Newcastle House was once the seat of King – Harman family who owned the largest estate in Co. Longford in the 19th century. Nearby is the church of St.Munis - the present building replaced the church where writer Oliver Goldsmith born in 1728 in nearby Pallas – was baptised. 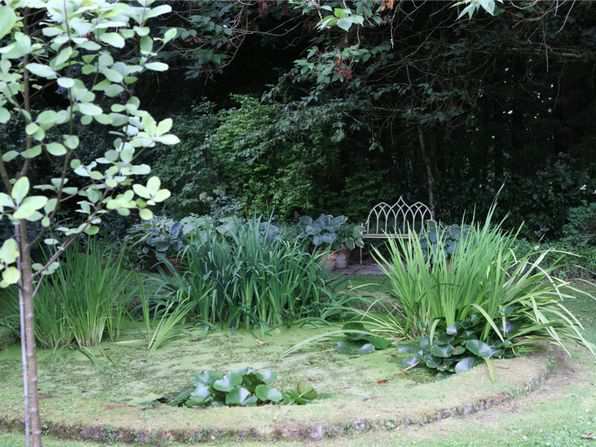 The property has been beautifully maintained over the years retaining its early period and architectural form. 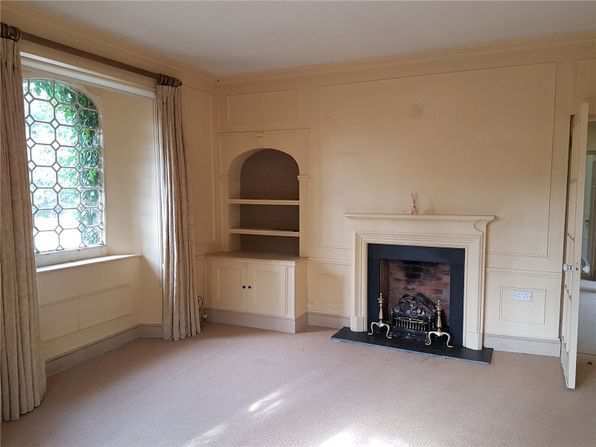 A detached three-bay single storey dwelling which is immaculate both inside and out. 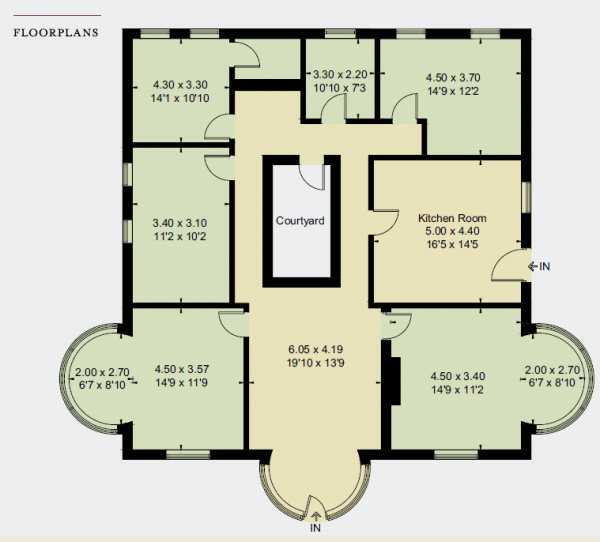 Accommodation consists of entrance hall, corridor hall, back hall, atrium, drawing room, kitchen & utility, 3 bedrooms (master en-suite) and bathroom. 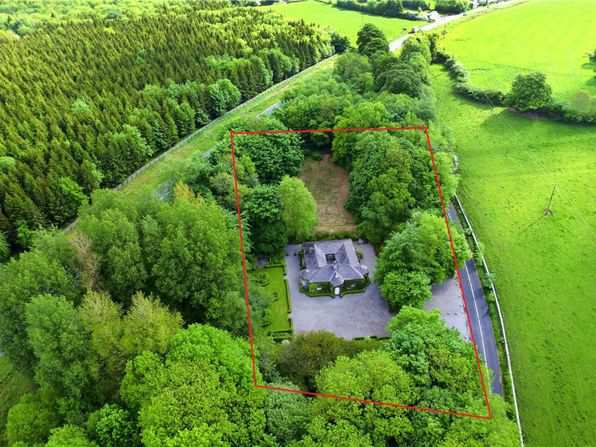 Situated on a quiet cul-de-sac, set back from the road on c.2 acres of mature, manicured gardens, located 4 km southeast of Ballymahon. Fixtures and Fittings: All fixtures and fittings are excluded from the sale including: garden statuary, light fittings, and other removable fittings, although some may be available by separate negotiation. 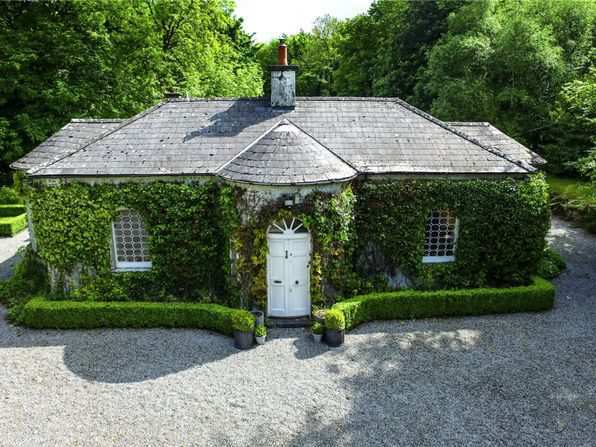 Isn’t this fantastic, right out of the pages of an Irish fairy tale. Surely there are leprechauns or gnomes or something in the woods nearby. Just close the wrought iron gate to keep their mischief away. Link to brochure that the Agent hands out, showing some of the rooms furnished — still no kitchen or bathrooms, though. I want to see the kitchen. Thanks Kelly. A very matter of fact kitchen. Still, I wonder what it’s original incarnation was. Thank you Kelly for sharing those pictures! It’s all too charming. This exquisitely designed and proportioned lodge is far more impressive than the irrationally rambling, clunky place it was meant to serve. 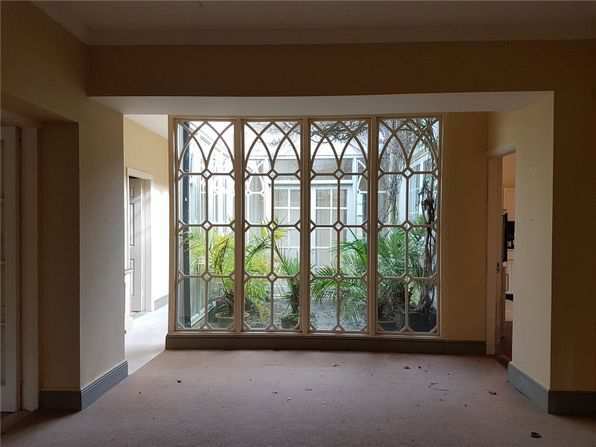 The Victorian styled, iron and glass enclosed, Roman court yard is so rad. DUDE! An interior courtyard – how cool is that!! L O V E this completely. I am done, this one has my heart ❤️ ! I wonder if any of the “wee little people” still occupy it. Interior courtyard is perfect for my kitties. No coyotes to eat them, bird, butterflies to chase and plants to sniff. Every superlative in the book falls short for this extraordinary house. It looks so serene and every detail is utterly lovely. I thought the same! The courtyard is for the cats! Oh, you’re right! I hadn’t thought of it, but the courtyard would be a perfect spot for safely letting the cats outside! This is beautiful! I love the archy details. And I know that ivy supposedly does terrible things when it grows all over houses, but it’s so pretty! Too bad I’m not looking to move to Ireland. Oh! One never knows what life will bring! Who couldn’t live happily ever after here! Wonder what the taxes are and if a horse was ever kept on the property. The courtyard does not appear to be enclosed. How beautiful at Christmastime. Oh, my, my, my! I’ll never be the same! 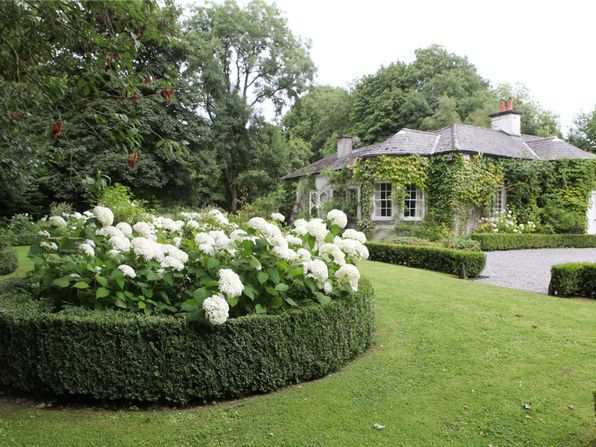 I have been fortunate enough to visit Ireland a couple of times and it would make me so happy to own this home!!! So beautiful. I dreamed for years of moving to Ireland and my husband and I looked into it seriously. In recent years the requirements have changed. A single person must have an annual income of $55,000 ($110,000 for a couple). Kinda throws us out of the running and this is a little expensive for a vacation home. Maybe Kelly can find a less expensive fixer-upper cottage for us! GASP! dreams could come true, all this for the price?! 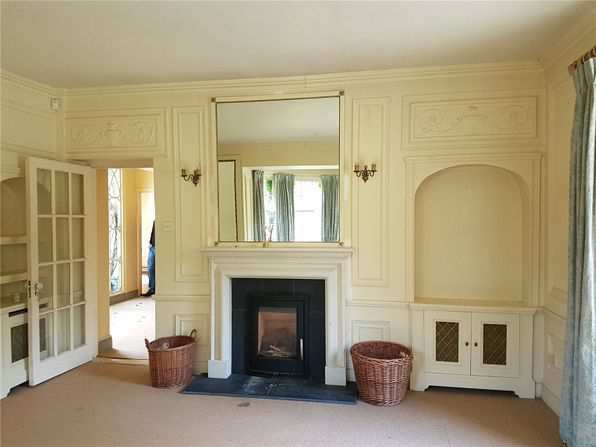 visiting in England now and properties are quite high, this is amazing! Just send me back home to this place and I promise to let you stay the weekend…. I will never recover from this one. I think I need a nap……. How cool that this house is listed here. I just finished reading The Vicar of Wakefield by Oliver Goldsmith about a month ago. LOVE Ireland! My husband & I honeymooned there 20 yrs. ago & have said we would go back & stay longer than 2 weeks. I vaguely recall Co. Longford but had I known about this place I would have stopped! It’s wonderful! I’m commenting now from beyond the grave because this house really did me in!! I’m out of superlatives to describe it. 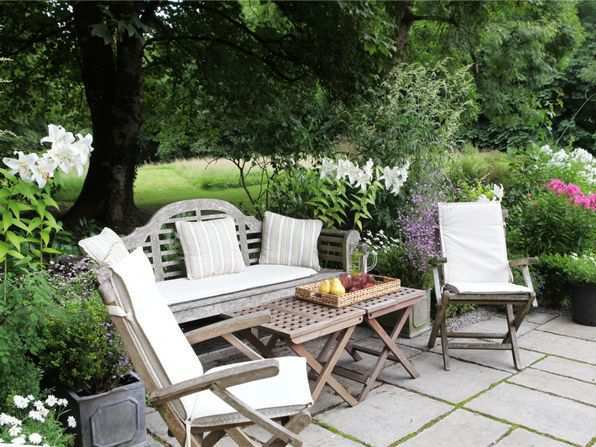 OK, what a charming, absolutely spectacular setting and dazzlingly perfect house! Sigh. OK, I’m not dead, but I have to lie down to recover after seeing this one. What isn’t there to like with this winner? LOVE those windows. Wonder what the bedrooms look like and the bath. Too, too charming! 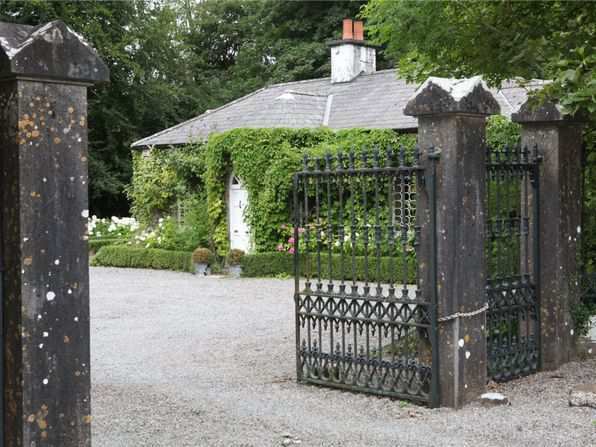 Come on lottery!Mama needs this house in Ireland! Oh my goodness-this is the house of my dreams! I haven’t yet been able to visit Ireland,but it’s on the Bucket List. I don’t even know WHERE in Ireland that it is located, but it’s a dream! I never thought of the safe space for the kitties, but that is a bonus! Now, if that Megamillions Jackpot is mine tonight, it will be mine, lol! Thanks for sharing this incredible beauty, Kelly!